N.B. We don’t currently sell tickets for Red Funnel, but use the search above to find tickets from alternative ferry operators. Begun in 1861, Red Funnel has grown into a highly successful, modern cross-Solent ferry operation. This travel and leisure company is based in Southampton, UK and provides group activities, UK holidays, freight transport and distribution services. Travellers experience quality service with Red Funnel which carries about 3 ½ million passengers annually. Red Funnel has won the RoSPA Safety Award every year since 1999 (including 2 Gold Medals.) They also achieved ISO9001 accreditation for shipboard management in 2008. 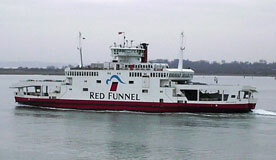 The Red Funnel Line is the original ferry operation to the Isle of Wight. Its long, colourful and distinguished history marks 150 years in 2011. The modern, integrated transport available today is barely recognisable compared to their humble beginnings. Passenger/car travel takes guests from Southampton to and from East Crowes, Isle of Wight. The ferry service operates on an hourly schedule. The RoRo ferries carrry over 200 vehicles and as many as 800 passengers. Comfortable seating is provided along with hot food, bar service and a leisurely cruise across the Solent. The caring and welcoming attitude of Red Funnel staff is readily apparent and their excellent service has no peer. The company offers Red Jet Hi-Speed passenger service as well from Southampton to West Cowes, Isle of Wight. This service leaves every 30 minutes. These catamarans carry foot-passengers only on the 23 minute crossing. At-seat refreshments are available onboard for the comfort of Red Funnel’s guests. 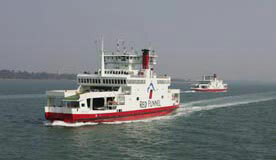 Red Funnel has the largest number of RoRo vehicle ferries to the Isle of Wight. There are more than 37,000 sailings annually. Their partner, Steve Porter Transport Group, provides a wide range of comprehensive freight services delivering goods to and from the Isle of Wight. Between them these two companies offer unmatched solutions for reliable, secure and cost-effective transport whether it is for ferry travel, parcel services, home delivery, unaccompanied shipment of trade vehicles, transport of dangerous goods, abnormal loads, etc. Travellers have many reasons to visit the Isle of Wight. This small island offers an extremely wide range of activities from golf to paragliding. Red Funnel’s guide to the island provides information on which activities are available at any given time. Their guide also gives information on the best locations to book each activity. Help is available for organising group events or filling a holiday with every possible activity. Horses may be hired to spend some time galloping along the beautiful beaches with water sloshing beneath their hooves. Catch a wave on a surfboard along the spectacular coastline. Families with small children can go fossil hunting, lama trekking, try spotting the island’s red squirrels, or just walking around enjoying the scenic vistas. Half of the Isle of Wight is designated an Area of Outstanding Natural Beauty providing fantastic opportunities for bird watching, nature hikes, or just enjoying rambling through the natural countryside. For visitors who enjoy pushing their limits, there are adrenalin fueled activities on land, in the air or on the water. Coasteering, cycling and mountain biking, kite surfing, paragliding, sailing, surfing, windsurfing, and pleasure flights around the island are all ways to get rid of excess energy and make great holiday memories at the same time. Fishing, horseback riding, kayaking, and other activities are geared toward teenagers. Families, groups, team building and parties can be centered around golf, shooting clay pigeons, paintballing, or other of the activities the Island offers. Red Funnel Line ferries provide access to all these and more activities on the Isle of Wight.